Simulations empower participants to be “change agents” – participants within their own familiar systems who model the change they attempt to bring forward. With this awareness of patterns that repeat, they will gain practical strategies to create partnership in human systems. Work problems tend to be people problems. Conflicts arise in organizations during big changes, when coping with cuts, or when things are reorganized, again. All too often, we have no time to renegotiate with others, find perspective, and employ new understandings. A good system for any team allows us to come up with new ways to cope, collaborate, and learn from each other. Mostly About Cupcakes, an interactive recipe, takes a team through an experiential learning activity. People learn how to negotiate the issues that always show up when smart, dedicated people attempt the hard work of collaboration. You Want Me to Make Cupcakes? Well, not exactly. Our cupcakes are conceptual, but the learning is experiential and immediately applicable. You might wear the Chef’s hat, and as Head Baker, your menus must be followed to the spoonful. Or you may walk in as a hungry, demanding customer who wants the favorite icing to always taste the same. And then, there is the able Assistant Baker, who both monitors the ovens for the Chef and keeps the devoted, hardworking, and creative Kitchen Staff motivated. Action-based activities engage the group with a rare level of instant perspective. Discovery through participation shows the team those missing ingredients: group awareness, a flexible view to the roles we take on, and a clear view to the system in which we participate. Experiential activities work best with an in depth debrief, which helps you see how your perspective is similar or different from others. What’s the difference between what you think you do as a leader and what you actually do in the heat of the moment? What shows up in the “kitchen” that shows up at your own place of work? This activity is a safe way to look at what kinds of things we might want to change for ourselves and our organizations. We know how important it is for any new training knowledge to be practical and applicable. That’s why we emphasize hands-on participation. At the Cupcake Factory, you’ll access tips for dealing with each “space” or role in the organization and craft an Action Plan through the experience as a template for creating more powerful work partnerships. Choose between 3- and 4-hour versions of this workshop. Customize the activity to focus on your specific organizational issues such as getting the managers to work together more effectively or giving leadership the opportunity to experience the system from a non-management position. Add an assessment--MBTI, Birkman on Demand, or Thomas-Kilmann Conflict Mode Instrument to deepen the conversation. 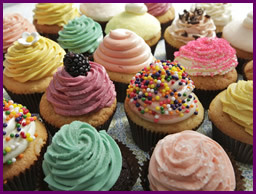 Mostly About Cupcakes can be combined with On Target and Picture This for a day long team building program.